Cover-ing Our Baseline | All Around Dogs Cover-ing Our Baseline | Thoughts on training and life with dogs. 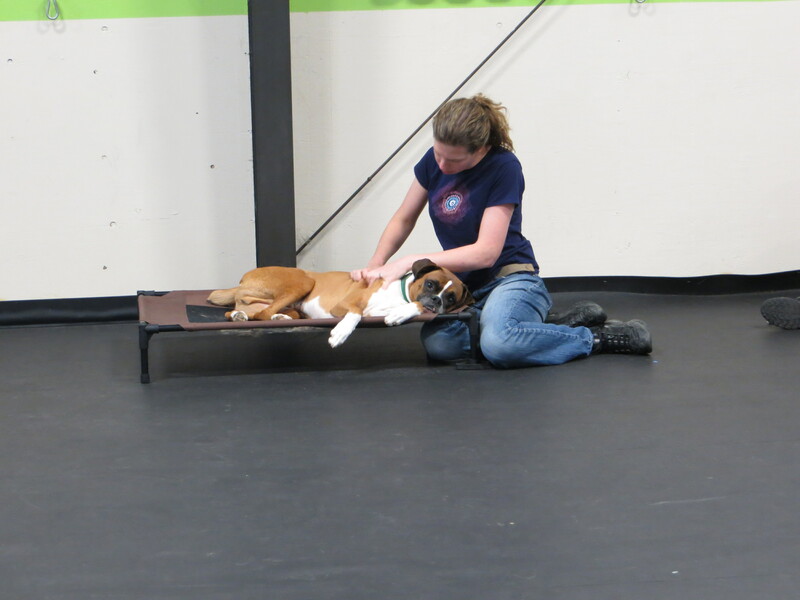 Yesterday Dash and I had the opportunity to attend a 4-hour mini seminar with Kayce Cover to work on conditioned relaxation as part of his behavior modification. I had actually worked with Kayce’s conditioned relaxation exercises when Dash was first diagnosed with low thyroid in 2008. One of Kayce’s students was a member of my club and got me started. Unfortunately, I unintentionally turned it into an obedience exercise, so that he was submitting to a position rather than actually changing to a relaxed state. What I ended up with was a useful knowledge of applying pressure to help him during times of high arousal, such as blood draws during vet visits. Progress on his overall behavior was very limited. When Dash and I began working with Jay Jack and Finish Forward in their BMOD program this spring, I was reintroduced to conditioned relaxation. This time, I wasn’t given a chance to turn it into an obedience exercise. They coached me to recognize and reward his small increments of change and progress, to choose when I should ask for baseline relaxation and when to accept dialing his arousal back a notch. I expected my takeaways from the session would be information and techniques to apply to future work. What I got was so much more valuable. First, I learned that I can trust Dash in a crate near other dogs. Even when those dogs are agitated. Even when the crate is mesh. The crating setup was different than I expected and it made me question my choice of mesh over metal for Dash’s containment. I didn’t think he’d bust out, but damage seemed highly possible. He was agitated at the beginning, as were most of the other dogs (we were at a behavior modification event afterall). I spent the first half hour or so clenched tightly, having a hard time listening to the presentation when there was a burst of sound from behind the barriers. But nothing significant happened. Second, Dash is capable of more than I believed possible. Our work with Jay and company had all been on an individual basis. The seminar had about 12 participants and that meant a dozen unfamiliar dogs. We were working on raised beds, but without barriers between dogs. We were organized from most to least reactive, with Dash falling in the middle and the dogs on both sides of us were dog reactive. When I took him out of the crate, he was vibrating. I was floored when he immediately lie down on the bed. And thrilled when it took very little time for him to settle into a fully relaxed pose, his CR baseline. He would still pop out of it easily if a nearby dog got excited, but he also went back quickly. When I took him out for the second round, he was more agitated and I worried that the first time was a fluke. But sure enough, with a little extra coaxing, he got back to easy and stayed there even when presented with reasonable distractions. Lastly, I discovered that I can now prevent, interrupt, and/or redirect Dash’s reactivity without my own stress redlining. I’ve spent 6 years “bracing for impact” – trying to manage situations where we might encounter a trigger or avoiding them altogether. Yesterday, spending extended stretches of time in a line up of 12 strange dogs, I only felt the prickle of fear bringing him out the first time. Thanks to Kayce and Dash, I felt a sense of peace as I worked him, talked to him, and enjoyed our time being calm together.